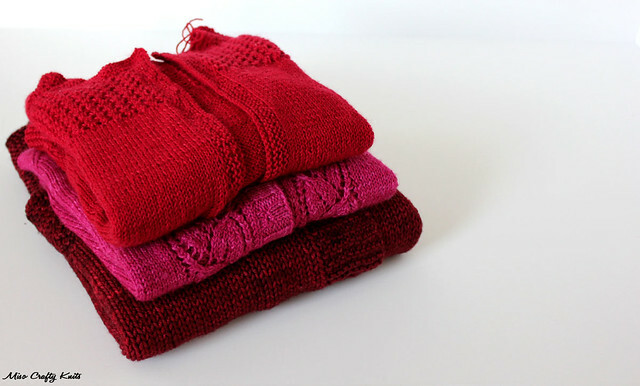 A few days ago I was going through all the projects that I had completed in 2012, which surprisingly weren't that many (compared to previous years, that is), when I remembered about the stack of unblogged knits. At one point last month I was kind of hoping of having a mini FO parade of posts before the year was over, just to prove that there really was more knitting going on around here than what was being shown on the blog. Obviously, that didn't happen. Some of these unblogged projects still needs to be blocked (ok, ok...almost all of them still need to be blocked), some need buttons, some need ends woven in, and some were sadly hiding away in a project bag and were completely forgotten (the horror!) until now. But as we all know December is usually a crazy time and the holidays typically take over everything. Well, that's what happened here. Thanks to holiday crafting I never got around to doing all the finishings on these projects and my house just isn't big enough to lay out all the projects that need to be blocked. Even if I did have these knits all ready for their blog debut, I just didn't have the time to have a photo shoot or to even the chance to take simple photos of them. Heck, just look at my Ravelry project page and you'll see that I haven't been keeping up to date on anything in a long while! It's sad really. - Grace:: started in October, was put on hold for the month of December, finished the day after boxing day when I realized all that needed to be done was the button and neck bands. - Special Knit City cardigan that I had design and (quietly and almost secretly) knit specifically for when I went to Knit City. I didn't want to say anything about it until it was actually done, just in case I didn't finish it in time. After all, I only had less than a month to figure out the pattern and knit it! - Juicy Tart :: knit last January during my quarantine, then finished in March, and has been patiently waiting for buttons. - Pasha :: I didn't get the chance to blog to say I even started this project! I had cast on at the end of October and finished a few days later. I hemmed and hawed over whether or not to rip out the crown and do another pattern repeat since it wasn't slouchy on my head at all. Then I left it. I panicked and didn't know what to do, so it seemed the best solution was to leave it alone. Don't tell me you've never done that! Anyhoo, then my awesome friend Liisa came to the island for a visit a few weeks ago and told me to just block it over a plate or something, and make the crown open up, then decide if I need to rip back. What a smart cookie she is. - Christmas stockings :: I had knit both the Munchkin and Brett a stocking each and totally ran out of time to knit myself one. Ok, that's a lie. I could have knit myself one in the 2 days before Christmas, but I was feeling a bit burnt out. So I didn't. And you know what? I didn't feel bad about it. I didn't feel guilty either. It didn't ruin Christmas. I'll just make sure I'll knit it for next Christmas. 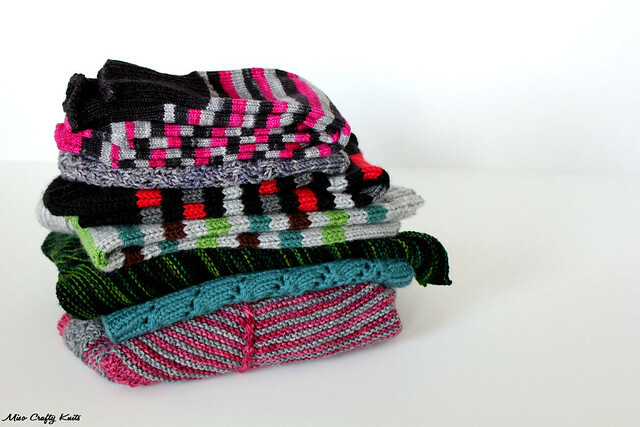 The beauty about these stockings: you only have to knit them once. So it's all good. - Hitchhiker :: I honestly wasn't in a hurry to finish this bad boy, as it was suppose to be my take-along-everywhere-in-my-handbag knitting. But it was such a mindless, potato chip knit that I finished it without realizing it. I was planning on starting a "to gift" box and put this in it, but I love the colour so much and how it knit up that I'm tempted to keep it for myself. I guess I'll make that final decision after I block it. - Secret knit :: I'm not allowed to talk about this one yet. Sorry! - Angelus Shawl :: This was a test knit for my wonderfully talented friend Em of Everything Old. She's released the pattern (which you can purchase here or here), so now I can finally blog and talk about it. Except that I'm a bad friend and test knitter cause I still haven't woven in my ends or blocked it...and this has been finished since September! Yikes! Don't worry Em, I'll blog about it soon! I definitely plan on blogging about these projects within the next few weeks or so. Once I get all the finishings done and they are all nicely blocked and ready to go. Oh, and once I can get some proper photos taken of them! I also realize, as I'm staring at a pile of yarn next to me on my desk, that there are also a few WIPs that I haven't blogged about either! Man, what have I been doing these past few months?? Oh yeah...I've been knitting! That's something a lot of people forget about when it comes to craft bloggers - the fact that we actually have to make the craft so that we have something to blog about! After the crafting we then have to become stylists, photographers, editors, and then finally bloggers. Phew! That's a lot of hats to wear! Anyhoo, my mission for the next few months is to finish up as many of the WIPs from last year. I've forbidden myself to cast on anything new, other than thrummed mitten - which I've been wanting and meaning to knit up since November. So I've spent the first few days of 2013 going over, organizing, and re-assessing all my WIPs. What I want to finish, what needs to be frogged, what's missing what (I have a horrible tendency to take the needles in use and either leave the knit on cable needles, waste yarn, or replace them with needles usually a size or 2 smaller...and not leaving myself a note as to which size and/or needle I was using! ), and what needs further consideration (like is it worth it to try to fudge the rest of the project because the designer decided to omit the size and instructions you were using!). Anyone doing something similar? Or will be? I know I definitely got my work cut out for me! Yeah, I have several 2012 projects that are finished and in wearing rotation but not yet blogged about. The problem is getting one of the kids to either model them or take the shots of me wearing them. You've clearly had a productive year though. 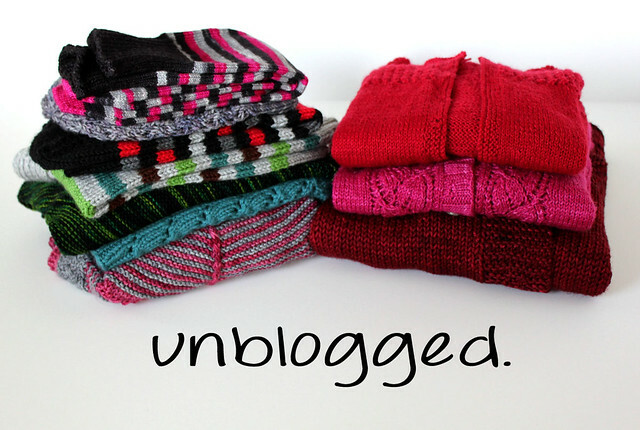 Your unblogged cardigans looks awesome - especially that Juicy Tart. I'm using the same yarn right now on a sweater and love it so much I can't wait to finish and wear it but I fear that, like you, I will get stuck on the buttons... it always comes down to the buttons in the end!